Matteo Ricci’s journals, which had been translated and edited by Nicolas Trigault and first published in Latin in 1615, in Augsburg, were rapidly published in other languages and later editions. 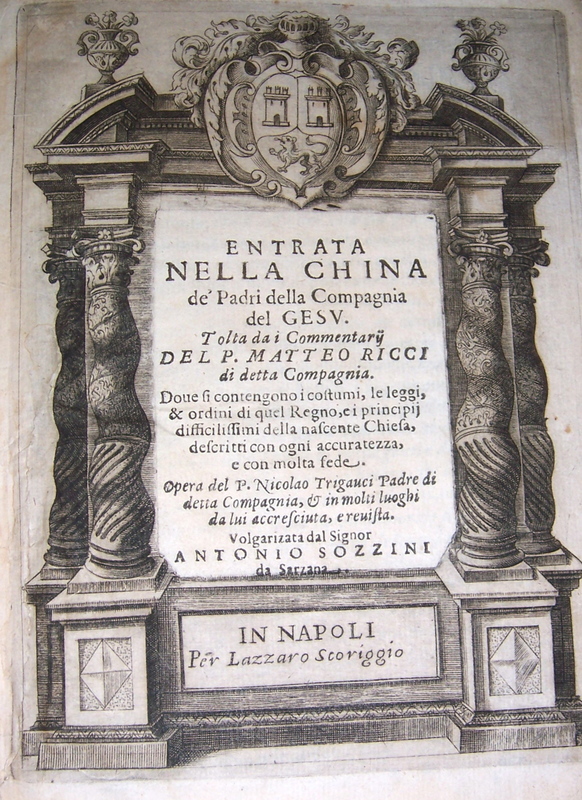 The present work is one of the early Italian language translations of Ricci’s book about China in the sixteenth century and the progress of the church there. It was published in Naples in 1622 by the printer Lazzaro Scoriggio, having been translated by Antonio Sozzini, who was originally from Sarzana. Not much is presently known about either of these two individuals. The title page has the usual elaborate building structure framing the text of the book. In this edition, however, all the religious symbolism of the first edition has been removed. The IHS symbol at the top of the structure has been replaced with a crest of arms (whose crest of arms is not presently known by this writer) and both Ricci and Xavier have likewise been removed from the picture. Although the result is now a totally secularized image, with merely stylized columns and a lintel bearing a crest, it is more than likely this was the product of the printer’s needs to cut costs and keep things plain rather than an instance of censorship. The title, after all, does describe the progress of the young church in China. A help page explaining the difference between the book readers and how to use the scholarly search. Jesuit missionaries were fascinated by the culture of tea drinking and described it in great detail, from its cultivation to its medicinal properties.